Charith Senanayake, the former Sri Lanka cricketer and manager of the national and ‘A’ teams has suggested that a one-day series be played between the Sri Lanka side and the Sri Lanka ‘A’ team prior to the World Cup in May. “I suggested this series on Facebook and there was a lot of positive response to it and everyone supported it,” said Senanayake. “I said that because at the moment I realize that some of the national players are not pulling their weight and some of them are not fit enough to be there. If we are sending a team to the World Cup we have to send a team for the right reasons. That’s why I suggest to play a series against the ‘A’ team and see how the seniors fair because over a period of time the ‘A’ team has done consistently well,” he said. Sri Lanka ‘A’ team coach Avishka Gunawardene was of the view that opening bat Avishka Fernando and all-rounder Kamindu Mendis both aged 20 are ready to take the next step into the senior side and should be considered serious contenders to be included in Sri Lanka’s 15 for the 2019 Cricket World Cup in England starting in the final week of May. Gunawardene however cautioned against picking them for Sri Lanka’s next series against South Africa, which will be the forerunner to the World Cup. 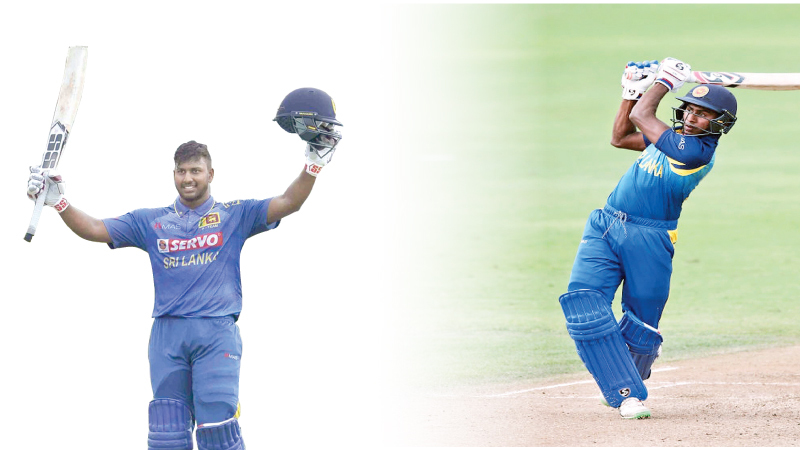 “Avishka Fernando and Kamindu Mendis all these guys are ready to play, but I am not sure that the South African tour is the one that they should be exposed to start with,” said Gunawardene at the end of a successful unofficial ODI series against Ireland ‘A’ which Sri Lanka ‘A’ won 5-0. “Even the senior Pakistani batsmen struggled against South Africa on those tracks and against their attack. I am not sure whether we should start these guys’ careers from South Africa. My thinking is if you want to take 2-3 youngsters take them straight to the World Cup. “They are rookies. The world hasn’t seen Avishka, Kamindu or Asitha Fernando so they don’t know what they are capable of. You can give the opposition a surprise package by taking them along to the World Cup,” he said. “Two years ago they brought Avishka into the senior side and played him against Mitchell Starc when he was just 19. That put his career back by a year and a half. Finally about 6-7 months ago we spoke to the selectors and said that he was good and that he has been in the system and now he is out. We decided to put him back into the system because we knew he was good enough. Now he is back on track again,” Gunawardene said. Fernando was the star batsman in Sri Lanka ‘A’s clean sweep of the Ireland ‘A’ ODI series rattling off three centuries in the five unofficial ODIs and two fifties so that in the five innings he played he passed the fifty-run mark in all of them. Middle-order batsman Mendis struck two fifties and finished the series with 137 runs and eight wickets with spin which he bowls with both arms. 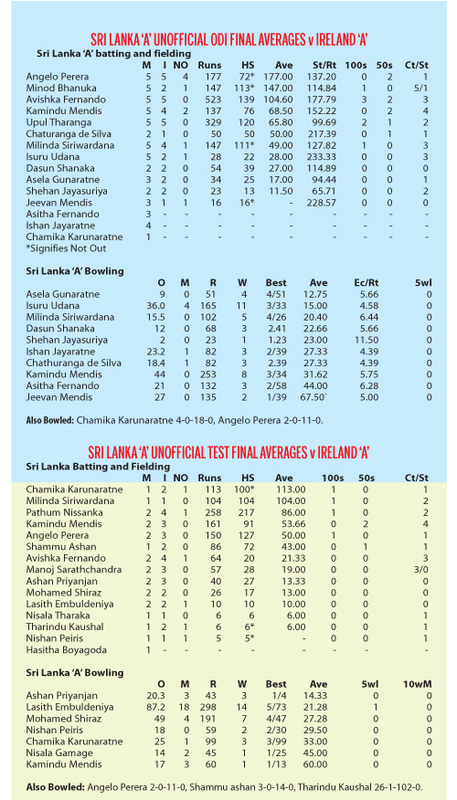 Gunawardene attributed Sri Lanka ‘A’s outstanding success against the Irish in the unofficial ODI series to the good pitches that were prepared for all five matches which resulted in Sri Lanka ‘A’ running up totals in excess of 300 plus on each of the four occasions they batted first. “Throughout the series we played on good tracks that was the big difference. Generally you get tracks in Sri Lanka that starts to crumble or to slow down. We basically played almost all the tracks with more than 5-6 millimetres of grass. That led to batsmen putting up big totals and in the last ODI we scored over 400 and they also scored 300. In another game we got 360 and they got 300, and in another game they got 270 and we got those runs in 35 overs. The scores were high and the batsmen were scoring runs because the tracks were good,” said Gunawardene. “We had grass and the ball was coming onto the bat. You need to develop batsmen playing on good tracks. Not only for ODIs even for the longer version because with the Lankan weather you prepare a decent track it will give something for the spinners when it comes to the third and fourth day anyway. It should not be a turner from day one. The first day the fast bowlers have a chance so it’s fifty-fifty and batsmen will enjoy batting on the first two to three days. “If you take the recent English tour the only ODI game we won was at the R Premadasa Stadium on a good track where we made 350 runs. Depending on the opposition and the conditions we need to prepare tracks but more or less I would say where batsmen can make runs. If you take our ODI side the entire last year we didn’t score a single hundred, even on matches played at home. The wickets we played on in the Test matches even the batsmen couldn’t score runs. “As ‘A’ team coach I have always said we want to play on good tracks because these are the cricketers who are going to play in the next level. If you take international cricket today most of the ODI games are fairly high scoring ones which means the tracks are good and flat. Our bowlers also need to learn how to bowl on flat tracks. Your skill will develop when you play on tracks like that. The bowlers will have to learn something if they are going to play at the next level,” he said.